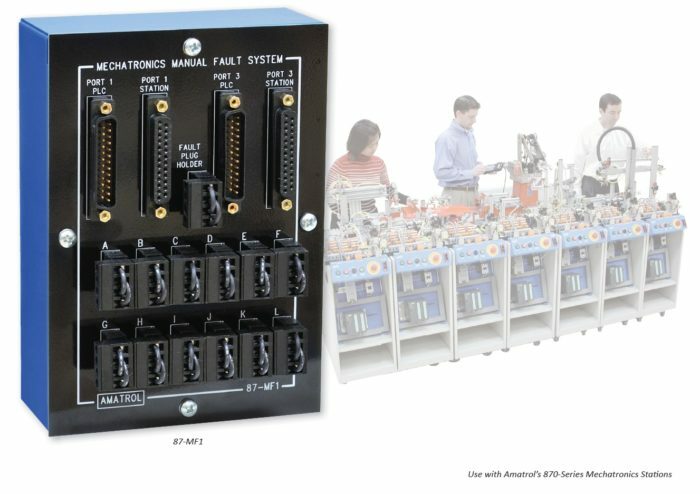 The Mechatronics Manual Fault Insertion Module (87-MF1) adds troubleshooting capabilities to Amatrol’s 870 series Mechatronics system. Mechatronics systems are used in almost every industry including manufacturing, material processing, and packaging. The ability to troubleshoot these systems quickly is essential in today’s competitive markets and the 87-MF1 can enable your learners to acquire these skills. The 87-MF1 Module provides the ability to insert 12 faults to a mechatronics station. Add a module to one or all of your mechatronics stations to give learners a real-world troubleshooting experience. Sensors, switches, and PLC faults are just a few of the available faults. To insert a fault, the instructor simply replaces a Standard Circuit Plug in the module with a Fault Plug. Once inserted, the Fault Plug is unidentifiable from the Standard Circuit Plug. This ensures that the learner cannot look at the fault module and see which fault has been inserted, avoiding the common problem of using toggle switches to turn faults on and off. If you want a more sophisticated fault insertion method that provides computer-based electronic fault insertion and performance tracking, ask about Amatrol’s electronic fault insertion system, FaultPro, the only electronic fault insertion system that automates tracking the learner’s troubleshooting experience.